How do you know which ink cartridge to replace in the PSC940 printer as you don't get any warning on the PC? Thank you. Your PSC 940 printer should notify you if you need to replace the black or colour cartridge. We suggest that you consult your printer manual or contact HP for technical support if you're having a problem with replacing the ink cartridges, unless the cartridges are faulty. In this case, we recommend speaking to the supplier of your PSC 940 ink cartridges. Will HP PSC 940 ink cartridges fit the HP Deskjet 840C? Thanks. The HP PSC 940 is an economical solution for printing, scanning, copying, and faxing needs. This multifunction printer is ideal for home or personal use (and even for offices that don't have high-demand on prints). The HP PSC 940 boasts USB connectivity and a monthly duty cycle of 2,000 pages, plus a maximum resolution of 2400 x 1200 dpi for colour printing. 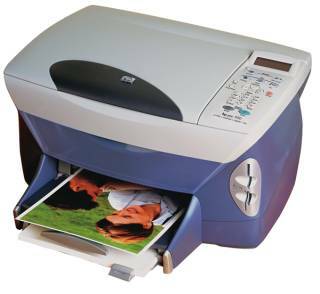 It uses drop-on-demand thermal inkjet and PhotoREt III photo quality imaging. Print speed is a bit slow, though, and its footprint is large. Weighing 8.75 kg and measuring 27.2 x 45.2 x 35.8 cm, the HP PSC 940 inkjet printer is a bit bulky especially for small offices or rooms. It has a flatbed scanner and an easy-to-use control panel. For connectivity, there is a USB slot plus memory card readers. The PSC 940 has a maximum input capacity of 100 sheets and a maximum output capacity of 50 sheets. The HP PSC940 works for both Macintosh and PC users. It can even work without a computer. Printing photos is a breeze Hewlett Packard's PSC 940, thanks to the built-in memory card readers. This all-in-one printer also comes with a fax machine, which is missing in some multifunction printers so you get a good feature set included with the HP PSC940. Don't expect too much when it comes to print speed as the HP PSC940 doesn't excel in this department. The PSC-940 printer by HP also has limited connectivity options.